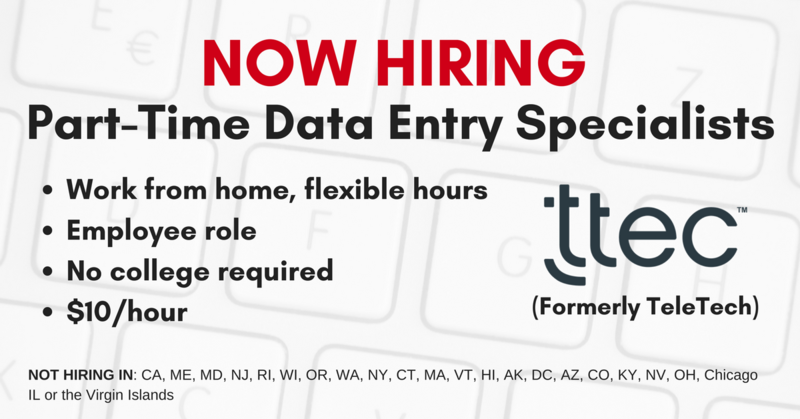 TTEC, formerly known as TeleTech, is hiring more Data Entry Specialists. Part-time for 20-30 hours per week. Pays $10/hr. No college required. Employee status, not independent contractor. They’re hiring from most states, but not from CA, ME, MD, NJ, RI, WI, OR, WA, NY, CT, MA, VT, HI, AK, DC, AZ, CO, KY, NV, OH, Chicago IL or the Virgin Islands. You are self motivated and have excellent time management skills. Attention to detail and a keen sense of accuracy describes your work ethic. You are SO READY to ditch the hectic commute to work each day and trade it in for a walking commute in your slippers! If you are searching for the ultimate life balance with a flexible schedule – search no more. Apply today to become an At Home Data Entry Specialist on our team! As a TTEC (formerly TeleTech) At Home Data Entry Specialist, you’ll use your “get it done”, multi-tasking, professional approach to meet and exceed goals. From the comfort of your home, we’ll provide you with paid training and ongoing coaching & support every step of the way! Our trainers will provide you with the industry knowledge so you can put your skills to use with confidence. A quiet, private place in your home where you can work without background noise. A USB drive from our approved list to access our systems is required. Click here for full details and to apply. For more jobs like these, be sure to check our Newest Jobs & Gigs page. To get our new job postings ASAP, like our Facebook page and check your feed for our posts. May you be working from home soon! This entry was posted in Data Entry Jobs, Employee Status, Hiring Companies, Work at Home Jobs and tagged Data Entry, TeleTech, TTEC. Bookmark the permalink.